The news about almonds gets worse and worse. In 2015, Mother Jones exposed that almond groves used up more water in California than the residents of LA and SF combined. 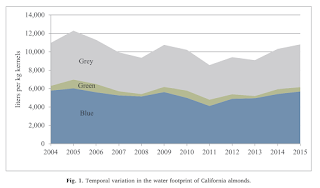 Almonds made up 17% of all irrigated farm land in CA and used up 10% of CA irrigation water used for food crops. Almond apologists countered that almonds are highly nutritious and that their water use should be weighed against their nutritional and economic values. The Almond Board of California (an industry group) hired researchers at UC Davis and CSU Sacramento to study the water footprint of almonds and their nutritional and economic value relative to other California crops. The evidence is in and it looks even worse for almonds. Remember the statistic of 1.1 gallons of water per almond? It's actually 12 liters or 3.2 gallons per almond. Water inputs to almonds by type. Notice the tiny amount of rainwater (green) used relative to imported or groundwater and how polluting it is. Almond apologists chime, "Almonds are nutritious!" True, but how do they rank nutritionally compared to other California crops? 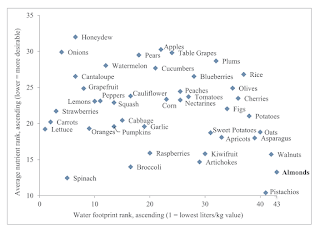 "Spinach, broccoli, raspberries, artichokes, and kiwifruit rank similarly in relative nutrient content but rank better in terms of water footprint." Almonds use more water than any other crop and provide less nutritional value than other tree nuts. 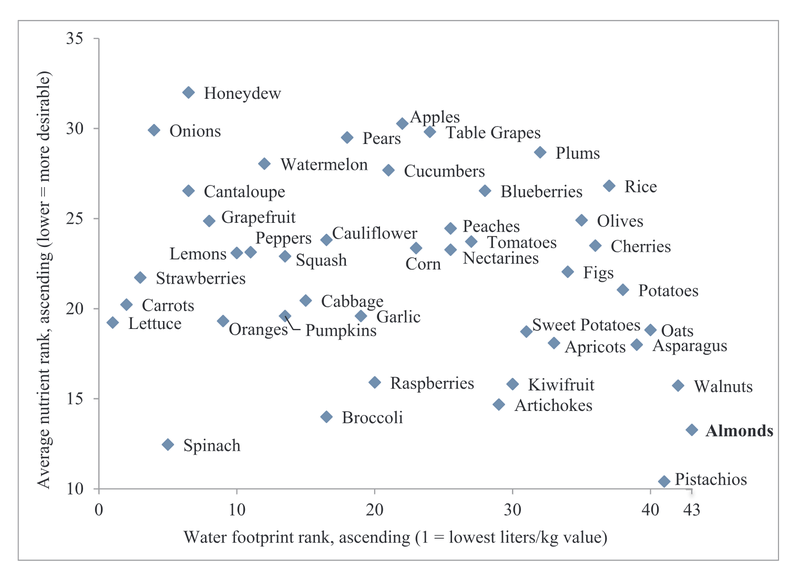 Almonds are comparable nutritionally to some row crops like spinach, broccoli and berries--but at much higher water cost. Almonds are a mediocre money-maker relative to their water input. It falls on the line with most other crops. Spinach, strawberries, and berries in general, are the real money makers. 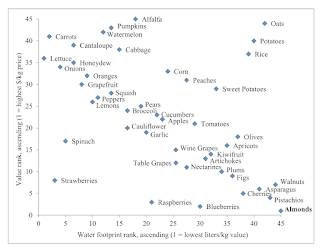 Almonds do bring in the most revenue per kilogram of all food crops, but with mediocre returns relative to saner crops. 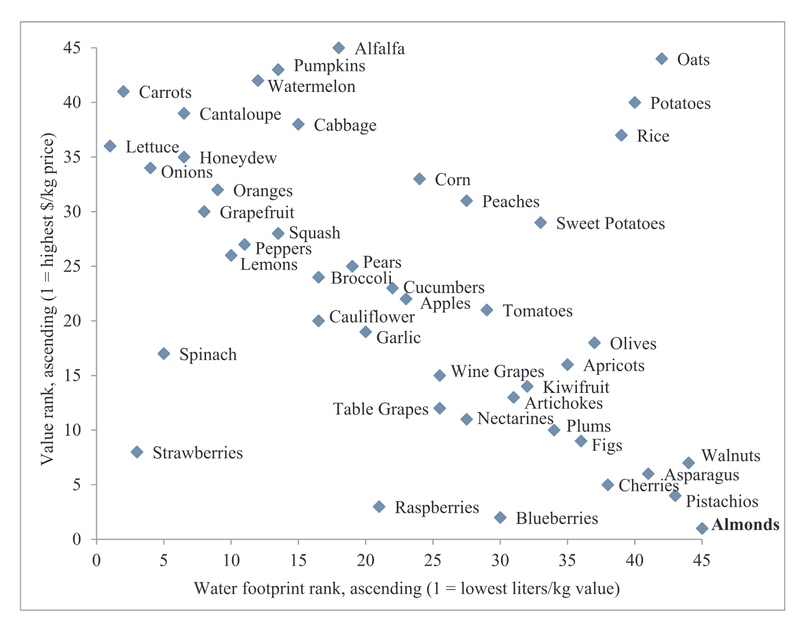 If we wanted to maximize revenue for water consumed, we should grow spinach, strawberries, raspberries and blueberries. Moreover, spinach and berries are row crops, which means their acreage can be rotated or fallowed as conditions warrant. Almond trees need to be irrigated year-round, every year. In drought years, when there is little rainfall and no water to import, almond growers pump obscene amounts of water from aquifers (some 100,000 to millions of years old) until the land literally breaks and sinks. The acreage under these almond farms is sinking up to 11 inches per year, breaking roads, bridges and aqua ducts. Almond farmers are privatizing a public resource, groundwater, and socializing the cost of their irresponsible behavior (pollution, broken shared infrastructure.) Until we attain the political will to drastically reduce and regulate almond farms, don't buy almond products. Please spread the word that vegan is not always good for the environment or the earth. This is a review that I posted to Goodreads* in 2018. 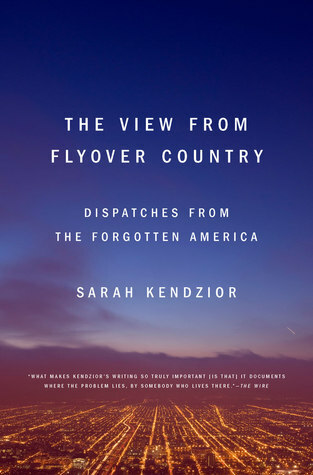 I've been telling so many people to read this book, follow Sarah Kendzior on Twitter @sarahkendzior and to listen to her podcast (with Andrea Chalupa,) Gaslit Nation. This is a compilation of her essays, originally published in newspapers between 2012-2014, organized roughly by theme. This can appear repetitive on the surface, but pay close attention to the dates and the world events she cites. 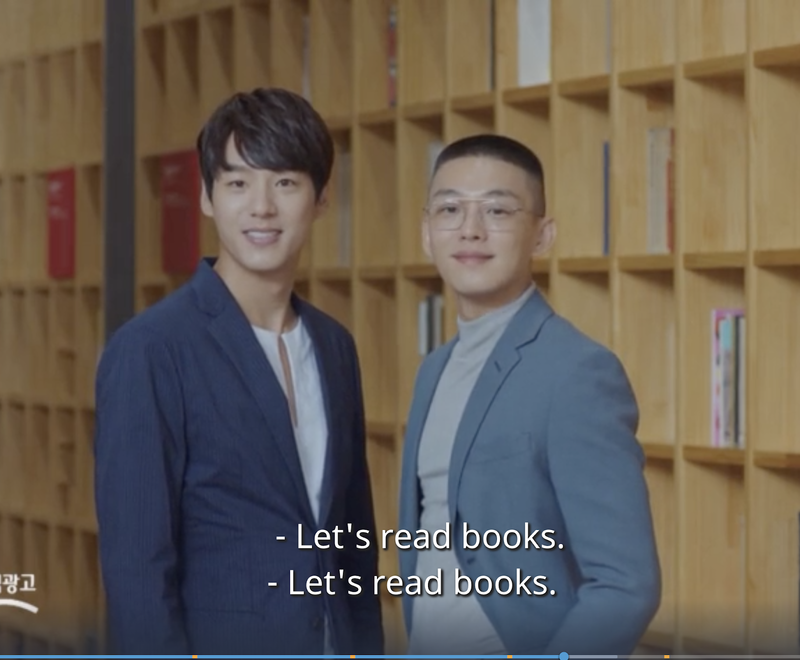 You can pick up and start reading anywhere. I highly recommend "The Political Consequences of Academic Paywalls" on pages 136-141. Dr Kendzior received her PhD studying authoritarian regimes in Central Asia. The for-profit journal business model is an inconvenience for physical scientists like myself. 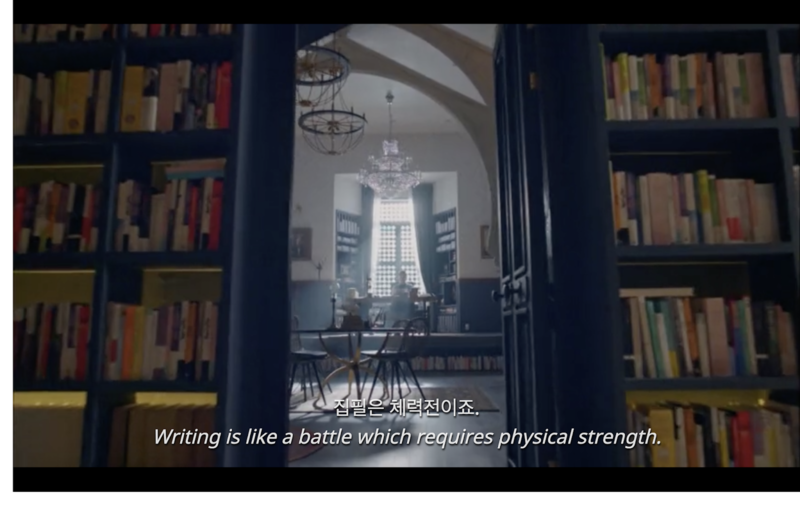 But having access to her published research, "Inventing Akromiya: The Role of Uzbek Propagandists in the Andijon Massacre," meant life and death for Uzbeks applying for political asylum. Russian-backed propagandists honed their skills in Uzbekistan, and then trained their sights on the US. A decade after inventing Akromiya, they invented Antifa. She is a uniquely qualified voice to explain the larger pattern that we see in current US politics. 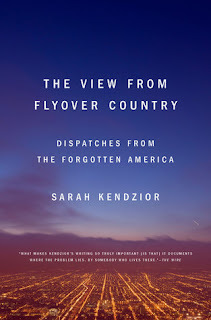 This book reminds me of the Flyover Country app. Set your route and download geophysical data along your route before you leave the house. If you are sitting in a window seat, the GPS reception on your phone (set in airplane mode) will be able to give you real-time information about features below. It also works on road trips and when hiking. It even works in remote areas without cell phone access. This app has a great backstory. Some geologists at the University of Minnesota came up with the idea and decided to apply for a small grant from a National Science Foundation program. They got approval in 15 minutes instead of the more normal 15 months. 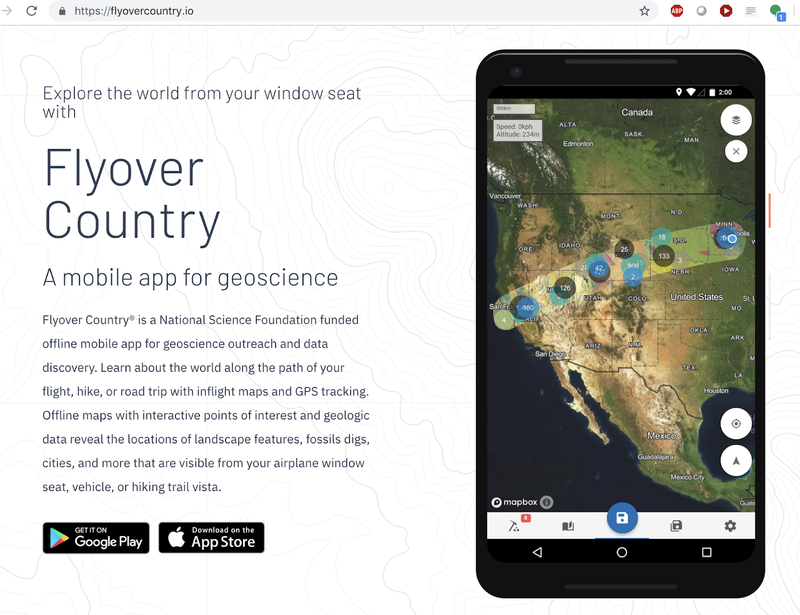 Flyover Country® is a National Science Foundation funded offline mobile app for geoscience outreach and data discovery. Learn about the world along the path of your flight, hike, or road trip with inflight maps and GPS tracking. 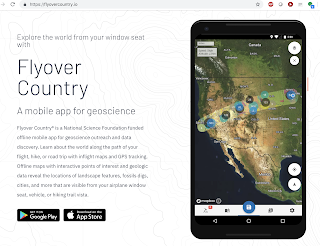 Offline maps with interactive points of interest and geologic data reveal the locations of landscape features, fossils digs, cities, and more that are visible from your airplane window seat, vehicle, or hiking trail vista. 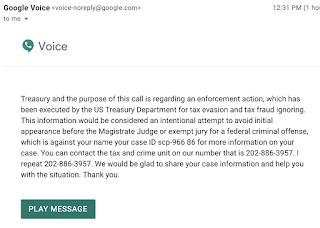 We just got the famous IRS impersonator robocall scam. What kind of low-life makes these kinds of calls? I question my commitment to opposition to "cruel and unusual punishment." 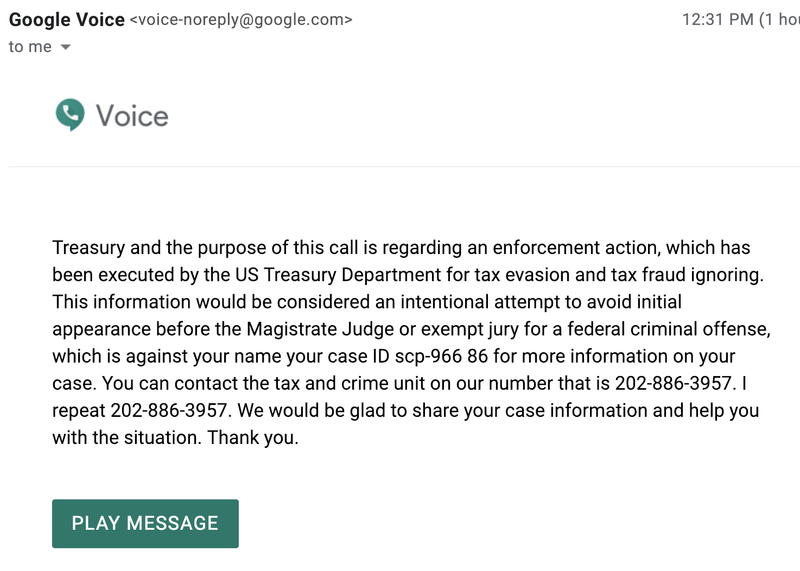 What kind of punishment would you inflict on the people behind these and other robocall scams? We are drowning in books, DVDs and fabric chez BMGM. Instead of unpacking boxes still in the garage 4 months after my move, I'm reading and streaming instead. This is the entrance to the hero's study where he writes his novels. 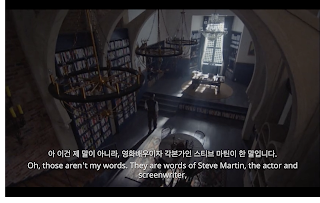 Bird's-eye view of the inner sanctum. 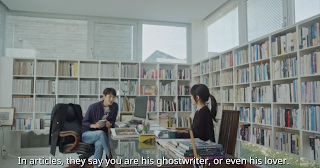 We meet the nemesis (a novelist/plagiarist) when they shoot a PSA in a library together. The office of the nemesis. He may be a villain, but his office has clerestory windows and wraparound bookshelves. This would be great for our urban townhouse, where our views are of the apartment building next door.